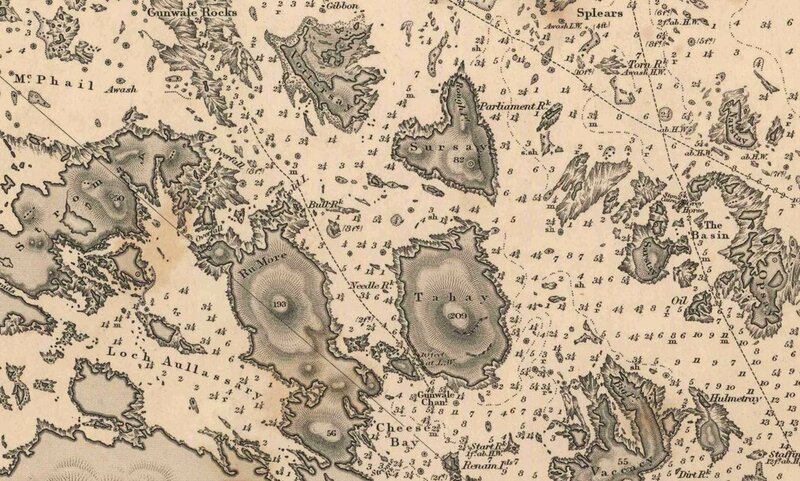 First Admiralty Chart of Sound of Harris dating 1857 (detail of Cheese Bay islands). Much of this week has been taken up with shearing both on our croft and on off shore islands in the Sound of Harris. These islands are part of the common grazing associated with Rushgarry township within which our croft at Sunhill is situated. We, therefore, have 'rights' to graze particular islands around Cheese Bay as set out in the township’s grazing regulations. For Berneray island where we live, this is a traditional crofting practise that dates back hundreds of years. It was hard work, not just the shearing but also the gathering in the hot sun and light breeze. Our sheep on the islands are not trained to come to a bucket of nuts, the ground is very rough and their legs are very energetic. I reckon that way back they must be related to mountain goats … though that is not based on science just experience. We are now one of very few crofting families that still use these islands. Stricter work boat legislation means that not everyone can afford to run a boat that meets all the safety requirements. We are lucky that we also use our boat to run our boat tour business Ocean Guides and for other scientific research associated with my husbands work as a marine scientist. Also, as the average age of crofters is getting progressively older the physical demands of gathering in such wilderness is just not possible for everyone. I do wonder sometimes how long we will be able to do it ourselves but for now it keeps us fit and agile. From the top of Tahay looking out across the Minch to the Isle of Skye, my fellow sheep gatherer down below. The islands in Cheese Bay are very rarely disturbed by people going ashore. It is like entering a wild land where we are very much the visitors. We often see sea eagles, encounter otter holts metres wide and sometimes we watch deer swimming between the islands. It always feels like a small expedition and we have to be kitted out for a long day. All the islands still retain the names given to them by our Norse invaders who arrived in the Hebrides around 950 AD. Names such as Harmetray, Vottersay, Tahay can be picked out as being Norse because of their ‘ay’ ending meaning ‘island’. Shearing on Tahay island inside an abandoned building. Not many of the islands have signs of being inhabited but Tahay in particular has a known history dating back to the mid 1800s. The fank (pen) on Tahay that we use to gather our sheep into for shearing is one such building. Close to the shore we are able to push the sheep along the edge of the water until they have no alternative but to head into the gap in the wall … or at least that is the theory. Then Andrew sets up to shear with me rolling fleeces all day long. I was rather taken with this years decoration of pink fox gloves!! A little further around the shore is a more substantial building and a small basic stone harbour. In one of our breaks, I took the opportunity to explore it more closely. In doing so I recalled the history of the people who tried to settle here back in 1840s. Settlement on Tahay dating back to 1840s. There were six families in all a combination of MacLeod’s and MacAskill’s. They had previously been cleared from the island of Pabbay, North of Beneray by their Landlord who wanted to make way for a sheep farm. This was all too common in the Highlands and Islands in the mid 1800s. As the industrial revolution set in across Britain, landowners saw land as a resource that could be exploited more advantageously through sheep rather than people. Thus came about a period now referred to as the Clearances when Landlords violently evicted people from their land. Those evicted then tried to settle elsewhere locally or emigrated to America, Canada, Australia and South America. The population of Pabbay dropped from 323 people in 1841 to 6 people by 1851, the island was never repopulated. The six Pabbay families tried their best to start a new life on Tahay. Standing on the hill above their settlement I can’t bear to think of the hardships they must have endured. Pabbay was lush, green and fertile while Tahay is dark, peaty and barren. Imagine trying to find enough food to feed your families from scraps of green grass around the fringes of the shore and what fish you could catch when the weather was fair. What did they eat all winter long? It is not surprising that in 1855, most of the families on Tahay took up the offer of the Highlands and Islands Emigration Society of an assisted passage to Australia. Those heading for Australia made their way south to Plymouth, where they joined the Royal Albert sailing on 15th August 1855 for Adelaide in South Australia, the journey was to take 16 weeks. Eventually they would head further North to take up farming and went on to lead relatively prosperous and successful lives. A long way from the heather shores of Tahay island in the Sound of Harris.